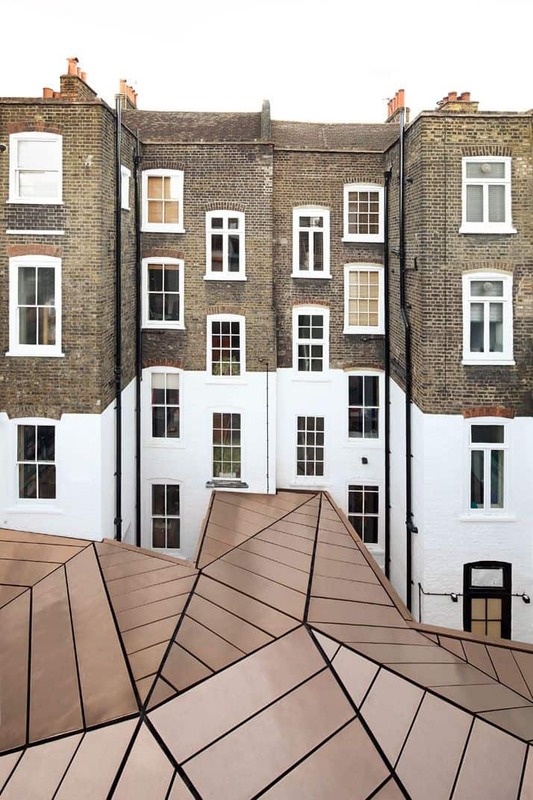 This UK building combines different textures to create a cool temporal effect. Old English brick meets mid-century painted brick meets graphic planes of modern copper. 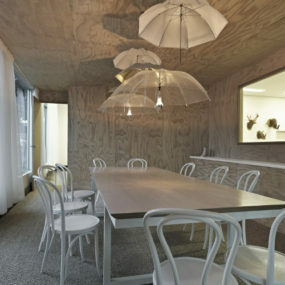 Designed by Emrys Architects, the building was reworked into a modern office space. 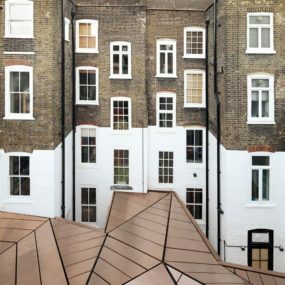 Working within historical conservation constraints, this structure showcases a dramatic transition from old to new. 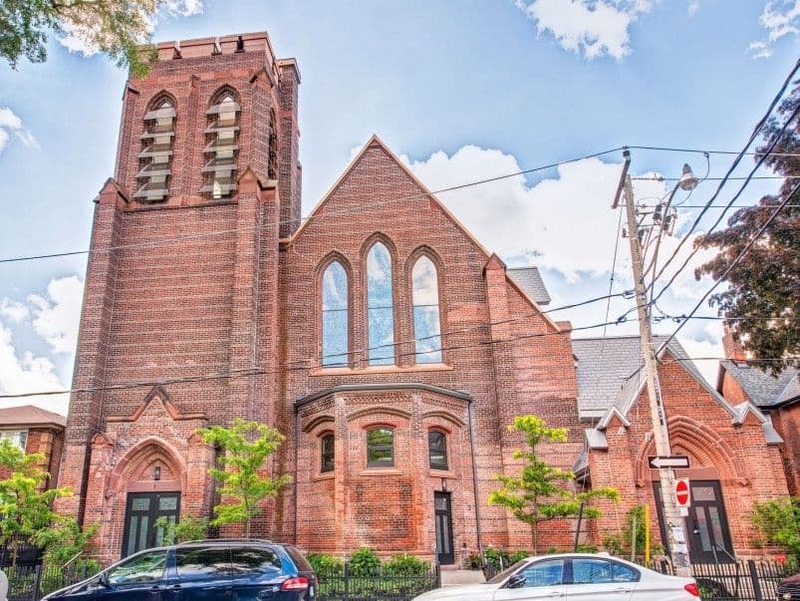 This 1913 Neo-Gothic Anglican church was converted into a 1870 square foot condo. 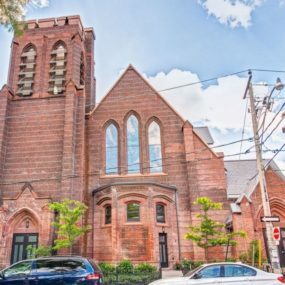 As part of its heritage designation, the Toronto building mixes modern decor with lots of restored brick, cathedral ceilings, and stained glass windows. 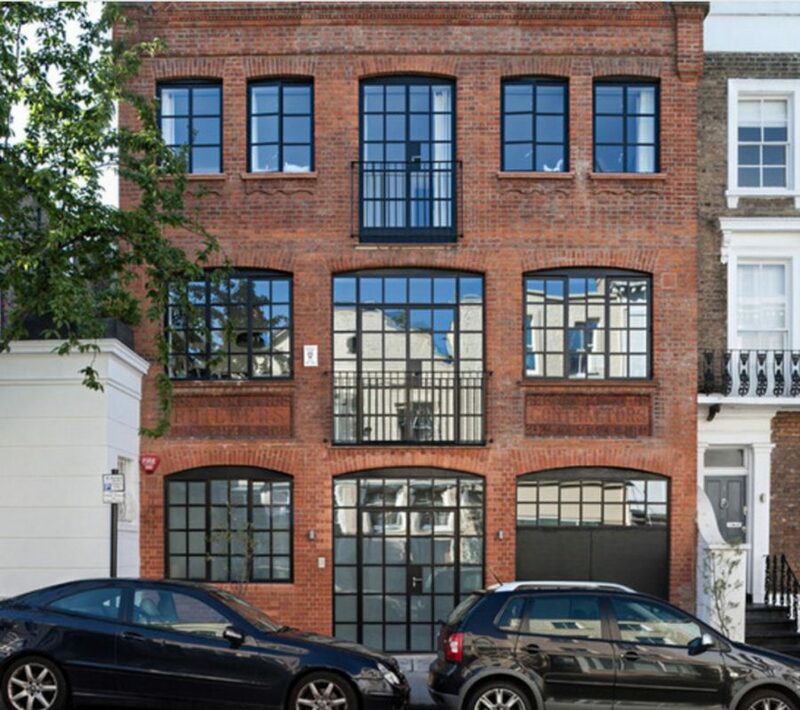 You’d never guess the immaculate home that sits within these brick walls. 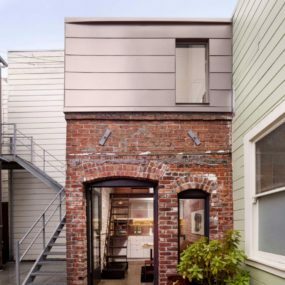 Sleek silver planes contrasted with a weathered rich red brick create a cool Brooklyn loft vibe for this San Francisco home. 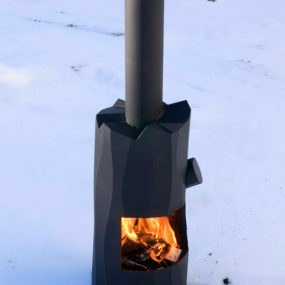 We love the look of combining textures on exteriors for a modern industrial look. Bricks don’t always have to face the same direction! 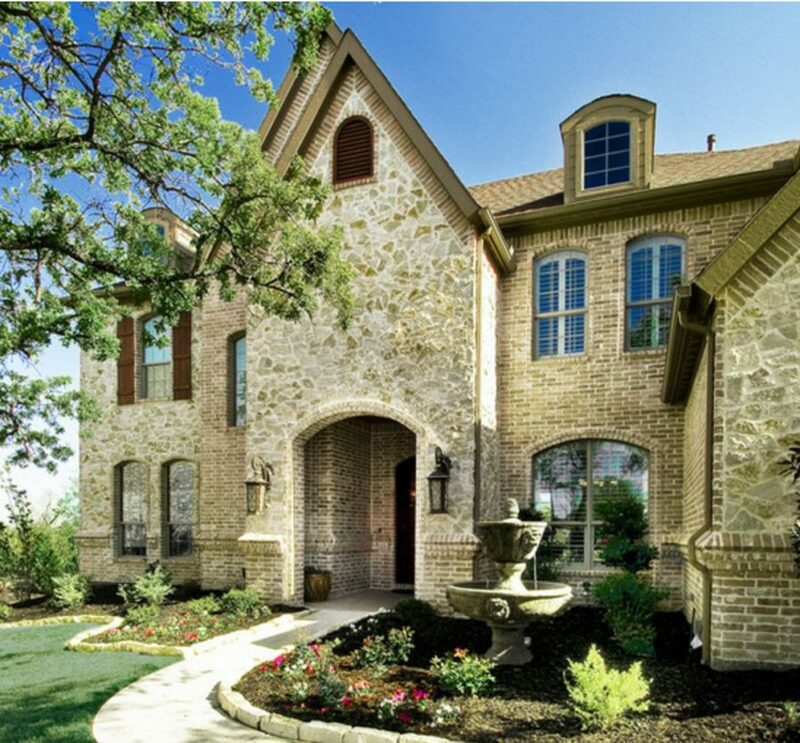 Switching up brick patterns and directions creates a whole new level of interest. 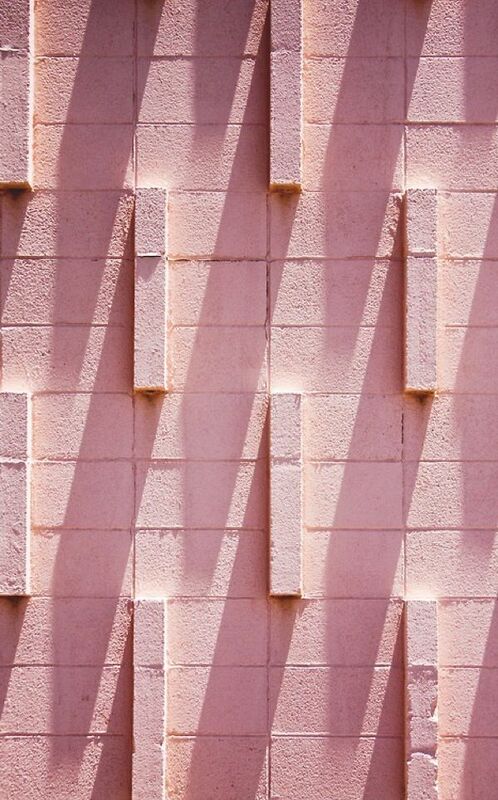 We love the look of this bold flamingo pink paired with a modern texture. An Instagrammer’s dream, no? 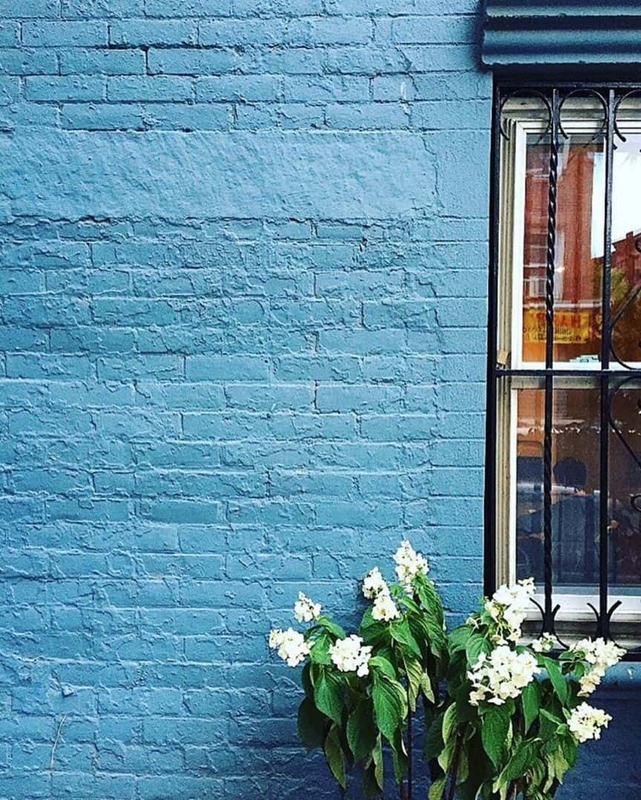 There’s something so charming about a blue painted brick wall. 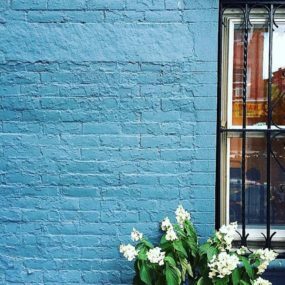 This Brooklyn building executes the look with a messy texturized paint job highlighting the aged bricks for extra character. 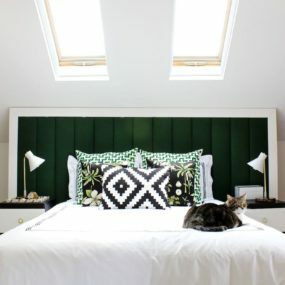 A simple plant can bring the whole look together, adding a touch of quaintness. In today’s highly competitive world of business, branding is so important. 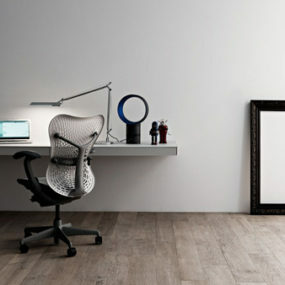 Why not brand your physical office space with a graphic brick design? This unique office building plays with architectural shape and symmetry immediately drawing the eye. 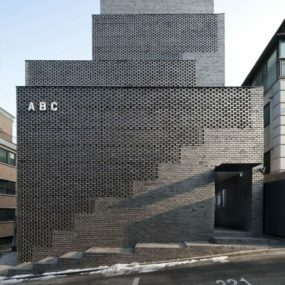 A graphic brick paint design adds further visual interest while maintaining a clean business face. 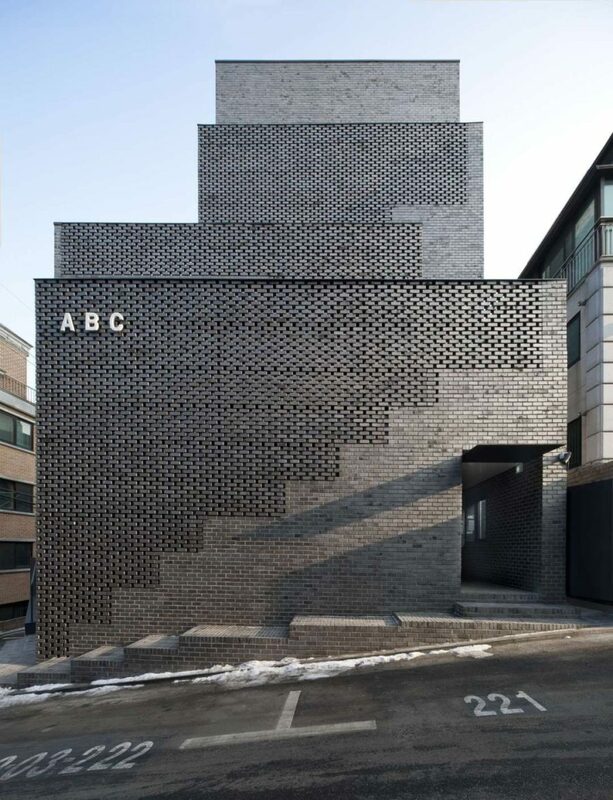 We love how this building also plays with it’s sloped hill setting on its staircase painted brick. 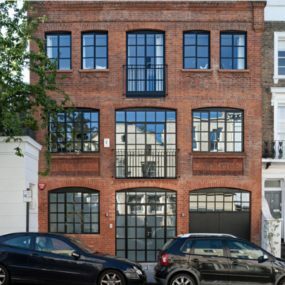 Red brick with black accents always make for a trendy industrial office space or loft, but the mirrored windows add a modern touch of cool. 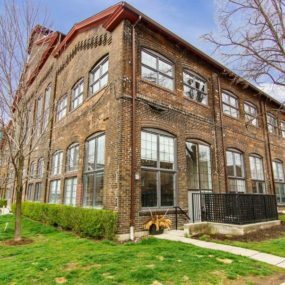 After sitting empty for nearly 25 years, this old Toronto train factory from 1903 was converted into 104 new industrial style apartments. Each apartment has wide open windows allowing for a ton of natural lighting. 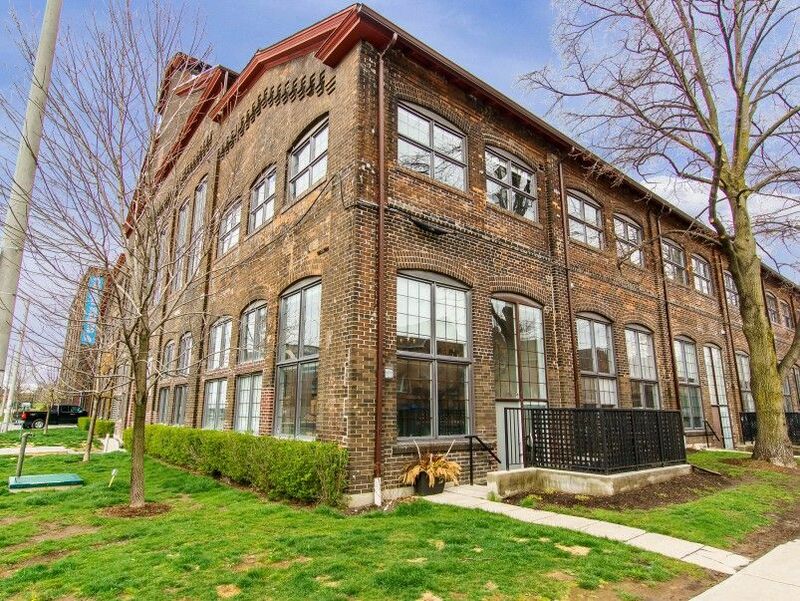 While the interior is completely renovated, the outside retains it’s original bricks and factory character. 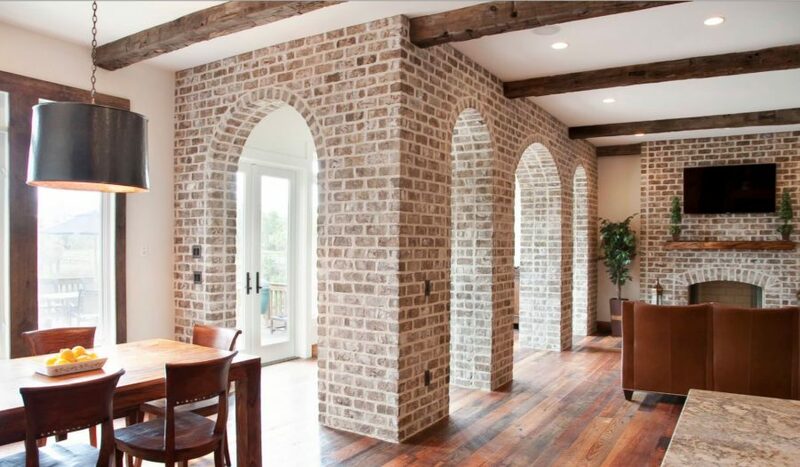 Brick arches–traditionally an exterior feature brought indoors creates an extremely unique living space. The matching brick fire place prevents the arches from looking too out of place and ties the room together. Arches create the illusion of a separate room and make use of extra space that might otherwise stand empty. If you can’t decide between two styles, why not bring them together? 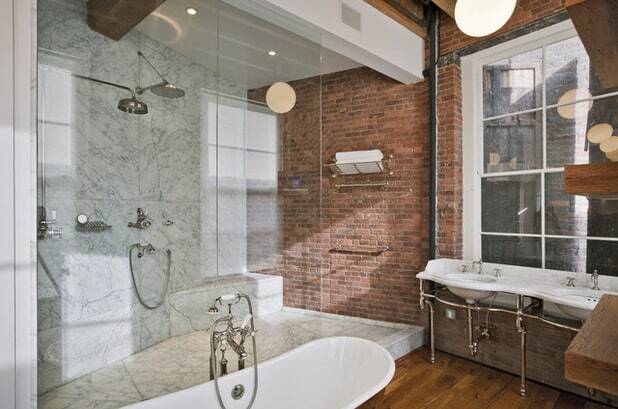 This Tribeca loft in Manhattan mixes industrial red brick with an elegant marble reclaimed from a building lobby. 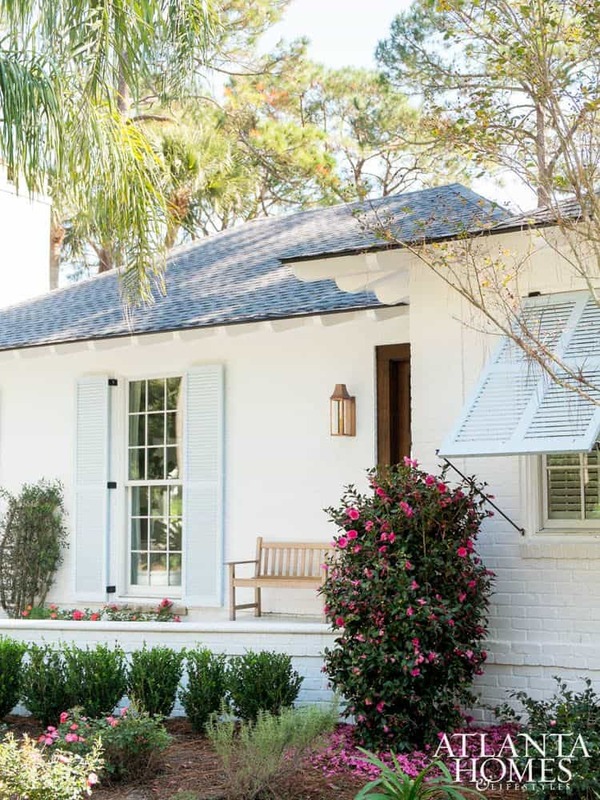 This Atlanta ranch-style cottage pulls a coastal chic look with a brightening white painted brick exterior. 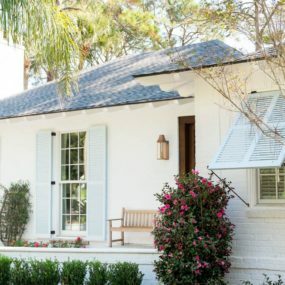 Accessorized with pastel blue shutters and a simple garden, this oceanfront home is the perfect summer getaway. Mixing materials and textures make for a subtle technique in constructing a more interesting look. 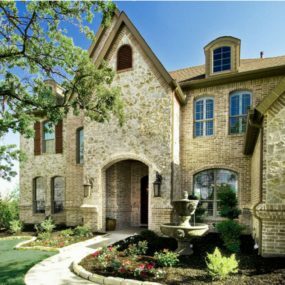 This home subtly mix and matches stone and brick of similar shades for a dynamic outer face. 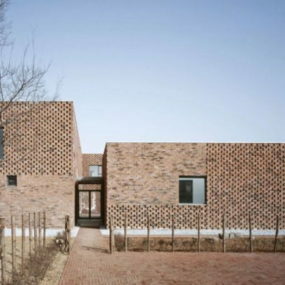 Bricks don’t just have to be flat walls. 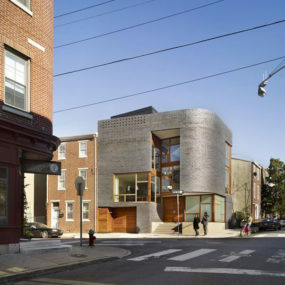 This rounded brick structure is a project designed by David Benjamin. The installation named “Hy-Fi,” stands in the courtyard of New York City’s MoMA PS1 as part of the museum’s initiative in having young architects design cooling pavilions for summer goers. 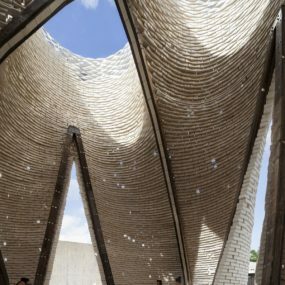 The innovative structure uses organic bricks made from corn and mycelium to construct a tubular tower that draws warm air up and out the top openings. 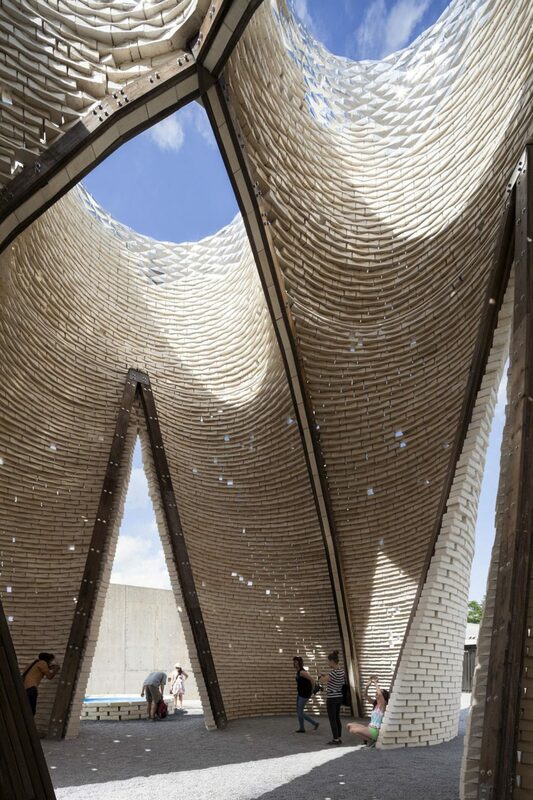 Perhaps this is the future of brick architecture and construction!? 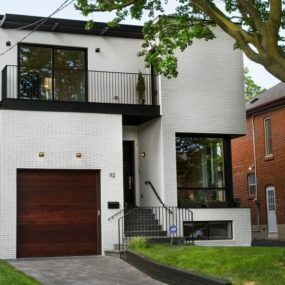 This modern Toronto home designed by Talayeh Hamidya, contrasts a clean white brick with crisp black accents. 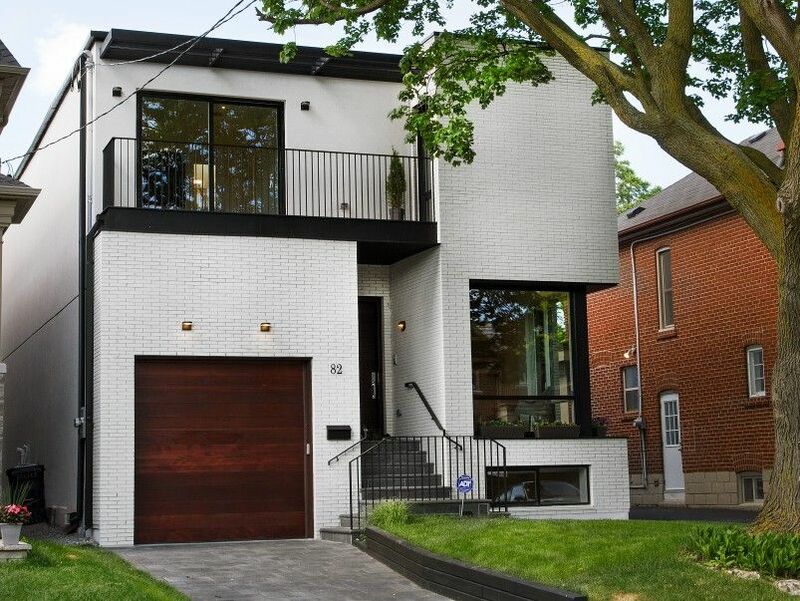 The boxy exterior makes for a distinct aesthetic in the midst of a mid-century neighbourhood. 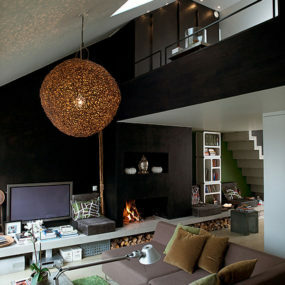 Hamidya designed the home with light in mind for every room. 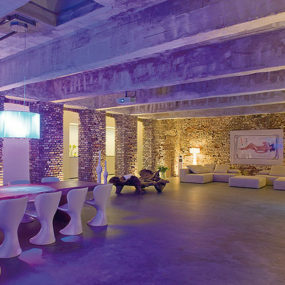 Selling for $3 million CAD, the house includes 5 skylights, even illuminating the basement. 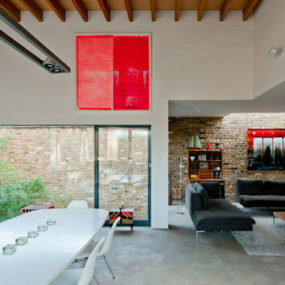 Rethink the traditional brick building by playing with textures, paint colours, and direction. 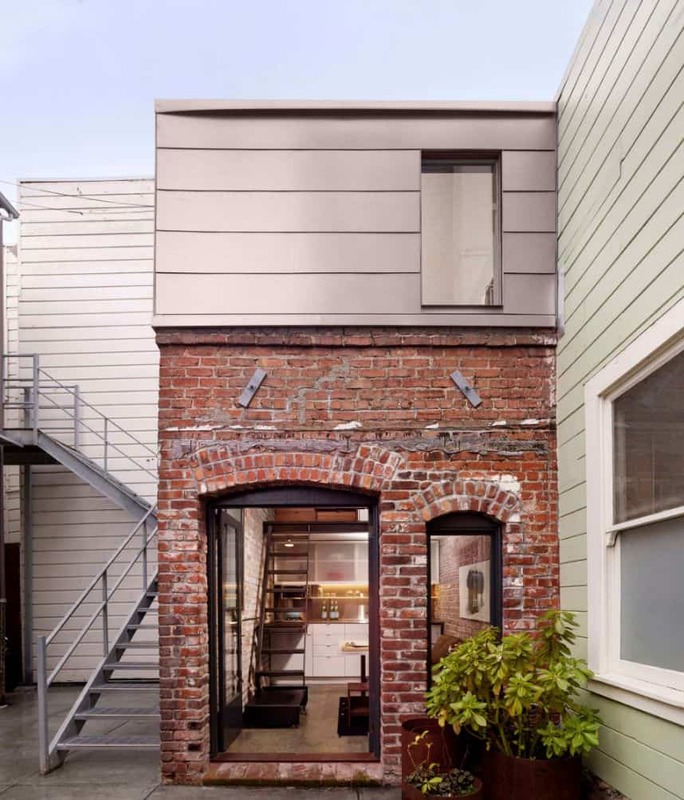 We love the endless variety brick architecture holds. And who knows, maybe your next home will be made of corn bricks!